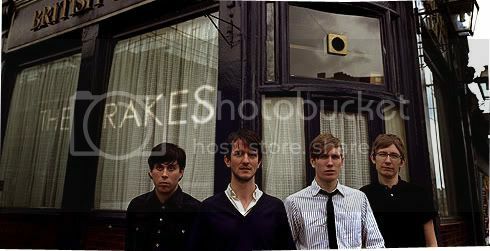 When it comes to bands such as London’s indie rock quartet, the Rakes, I realized that there’s nothing much to tell. Ask anyone; no one wants to listen to another generic, post-punk inspired indie-rock group that adds in the prefix ‘the’ in front of their names. Plus, in order to remain relevant to the current music scene, these sometimes stale or rather, stereotypical types of bands consistently cough out the same repetitive guitar music, resembling more of past precursors rather than defining new musical grounds that could undeniably be called their own. But then there’s me, who can’t really find any fault in music like this, for I’ve always held a personal interest towards the British music setting of punk-rock, art-rock, post-punk, new wave, and so on and what have you. UK’s the Rakes are no exception, offering the music fans in the indie circuit their brand of rock tunes, while displaying their flair and propensities towards the lo-fi quality of previous masterworks owned by the likes of Joy Division. "The World Was a Mess But His Hair Was Perfect" is a promising start, the same band as before with added pop detectability and more than a little cheek, a bubbling near-dance track with as many Doppler-effect keyboards as spidery guitar lines, all heeding that unrelenting single-note bass and the calm and assured disdain of singer Alan Donohoe. The album was inspired by a combination of choral music, the television show 24, Bond theme tunes, World War I poets and the Sugababes.